Bee sting treatment? Have you ever been stung by a bee? OUCH! I'm sure you'll agree that it's not much fun. This kind of treatment didn't sound like a very good idea from the beginning. Cir wasn't fond of being stuck and I didn't think I'd care much for sitting in a room full of bees. 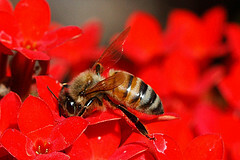 There are many people who feel that their condition improved when they had bee sting treatment. I don't dispute this. But if you opt for this type of therapy, please research it thoroughly and know the risks before you begin. Ironically, not too long after hearing about bee sting therapy for multiple sclerosis we actually met someone who was doing it. Well, actually I did. I was getting my cell phone fixed and this guy sitting next to me started talking. The conversation got around to Cir. I told the man, that Cir had MS. He told me about a farm in Wellington, Ohio where they did bee sting therapy. He gave me the address and his phone number and said Cir should come out and try it. I talked to Cir about it and did a little research on the internet. He decided he'd go ahead and try it. (Surprised me; he hates mosquitoes with a passion.) The therapy was free- that was a plus - so what could it hurt? We called the number the guy had given me and found out the days and times they were open. We got the directions and drove an hour to Wellington from our home town for Cir's first bee sting therapy. They only did the bee sting treatments twice a week in the evenings. There were several others there, either already getting bee stings or waiting their turn. They sat around in an assortment of folding chairs in a one car garage heated with a kerosene heater. The garage had been turned into a sort of office. The guy in charge took out a clip board and took down Cir's information. Name. Address. Phone number. When he was diagnosed. What type of MS he had. If he'd ever been stung by a bee. He had. And if he was allergic to bee stings. He wasn't. It's very important that you know if you are allergic to bee stings before trying bee sting treatments. The only way to know this is if you actually get stung by a bee. Your first bee sting treatment is not the best time to find this out. This is one of the reasons this treatment is considered high risk. Cir only got two or three stings the first time he was there. Apparently, as your body gets used to the bee venom, the therapists raise the number of stings each time you come for treatment. The returning patients tried to encourage him. They told him that it wasn't so painful. From the look on Cir's face, either they were lying or they all had a very low threshold for pain. On the drive back home he tried to convince me or maybe himself, that it wasn't so bad. Cir did go back for another four treatments. The stings he got were on his back, going up either side of his spine. He still didn't look like he was enjoying it very much. The last time he went, the therapists told him that next time the bee stings would be given on the back of his head. Now if you check out the about us page, you'll see that Cir is bald (this is by choice). The bee stings on his back had left scars. I'm not sure if this is normal, but he definitely didn't want to have scars on his head. And the therapists insisted the next stings would have to be done on his head. Needless to say, he hasn't been back for more. He got a few calls from the people giving the therapy. They encouraged him to continue. The only way bee sting therapy would help is if he got regular treatments. The build up of the venom in your body is what makes the difference. During one of Cir's earlier bee sting therapy sessions, we had time to talk to some wonderful people. 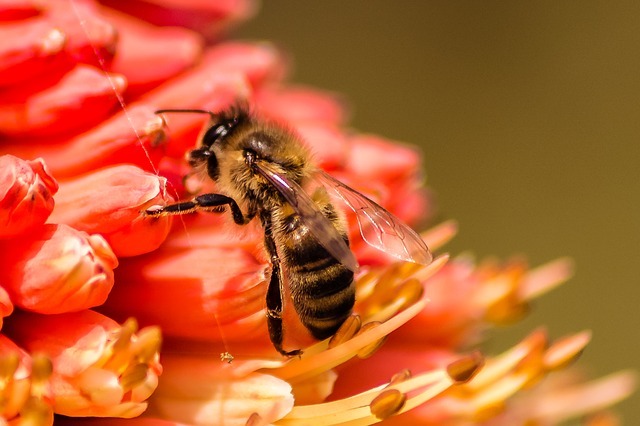 In one of our conversations, we brought up a friend who had a progressive form of MS. We thought this friend might benefit from having bee sting therapy. We eventually found that she had actually been there a few years back. Her name was actually in the log book. This friend did not continue with the therapy however, even after getting treatments for about a year and a half. It has been a while since Cir stopped going for bee sting treatment. And I can't say for sure that if our friend had continued with the therapy, she would be better. If she gave it a good amount of time (which I think she did) and didn't see enough of an improvement, then the decision to stop treatments was a good one for her. I think it's really important that if you opt for any alternative treatment, you do thorough research first. Ask questions. If there is a cost, do you feel it outweighs the value of the therapy? If you decide to go forward, once you get started, listen to your body carefully. Is there really improvement? Do you feel it's worth it to continue? What about the traveling distance, and the time involved? Carefully evaluate the pros and cons. Decide honestly if you feel you have improved or if you are still pretty much the same. And here's a video of our friendly neighborhood bee sting guy - Don Downs.